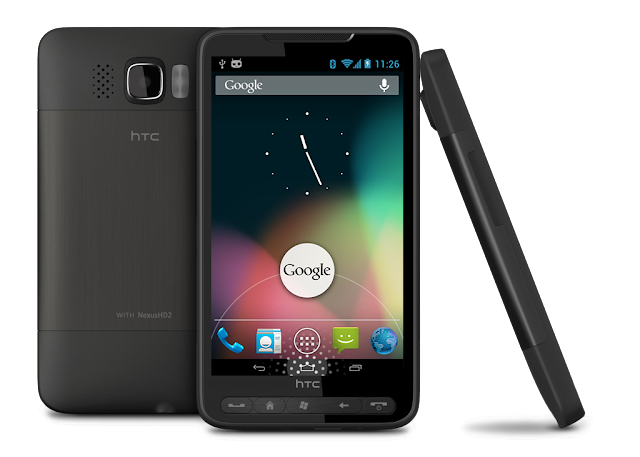 NexusHD2-JellyBean-CM10 is the first stable and fast JellyBean ROM which is mainly built from the CyanogenMod 10 source code and provides supports for native 720p video playback and hardware video recording for HTC HD2. Please visit my ICS NAND webpage for the installation steps. Flash Softkeys_Switcher_v3_for_NAND_and_NativeSD.zip to enable/disable the virtual softkeys after installation. Flash framework-res.apk_JB-v1.5-softkeys_in_landscape.zip to show/hide softkeys in landscape mode. Flash Power Button Mod (Thanks agbommarito). Changed ROM_NAME to NexusHD2-JellyBean412 from NexusHD2-JellyBean for NativeSD and DataOnEXT installs. Updated to the latest hosts file (May-21-2013) for blocking ads. Removed the user app (Wired Tether v1.4) since native USB Tethering is fixed. Fixed the camcorder config media_profiles.xml, so you can record videos more than once. Updated to the latest hosts file (February-25-2013) for blocking ads. Fixed that the softkeys is not enabled when doing a fresh install. Updated to the latest hosts file (December-07-2012) for blocking ads. Added Android 4.2 Stock Keyboard to support Gesture Typing. Added the lowmemorykiller tweak to get a faster and more responsive system. Decreased the maximum system partition size to 285 MB (Full install). Decreased the minimum system partition size to 200 MB (Custom install with everything unchecked). Built this version from the CyanogenMod 10 git repositories mainly. Added a SD-EXT partition checking feature when choosing DataOnEXT or NativeSD installations. Included copybit.qsd8k.so to fix the soft reboot issue when using SMS quick reply and some apps like Elixir 2 or OfficeSuite Pro. Updated to the latest hosts file (October-18-2012) for blocking ads. Moved Apollo.apk, Calendar.apk, Gmail.apk, Maps.apk , and YouTube.apk to /data/app/ folder to save system space. Removed talkback.apk to save system space. Please install the latest version from the Google Play Store if required. Updated to Android Jelly Bean 4.1.2 (JZO54K). Increased the pmem_adsp size to try to fix 'Allocate Buffer failed' while do the H/W video encoding. Updated AROMA Installer to support more accuracy install progress bar. Fixed MAGLDR NAND Kernel open error in v1.0. Added fully working camcorder with H/W video encoding. Disabled the camera feature in the Gallery2.apk since the camera preview is glitch. Included LegacyCamera.apk to support correct camera preview (Panorama is still broken). Included wpa_supplicant_v0.8.x_adhoc_update.zip to support Ad-Hoc WiFi network. Included Wired Tether v1.4 as a data app to support USB Tethering. Included WiFi Tether v3.2-beta2 as a data app to support WiFi Tethering. Updated Superuser.apk and su to v3.2. Updated to Google Play Store v3.9.16. Initial release. My first CM10 ROM built from the the source code of the CyanogenMod 10 and the Evervolv team. Fix a bug that the low sound bug may not be solved after unplug the headset. Register static Receiver in AndroidManifest.xml to replace the feature of background service. Add MainActivity so you can run it as a background service after installation. Play app built-in KeypressSpacebar.ogg instead of system's default notification sound. is bluetooth tethering working in this rom or need a patch like 4.2.2 V2.3? symbuzzer wrote: is bluetooth tethering working in this rom or need a patch like 4.2.2 V2.3? what is the best way to flash this rom? nand? data on ext? cron mod? and what the best size for system? I recommend DataOnEXT. Also, you should flash the NexusHD2-JellyBean-CM10.1.3 ROM. It's stable and more up-to-date. If you use DataOnEXT, you can resize your system partition to 400 MB.